During a trip to China, Elizabeth Rowland came across a jewelry booth covered with gorgeous and vibrant turquoise blue necklaces. She instantly fell in love with these exquisite beads and decided to share them with the world. In 2008, she launched her online jewelry shop, Abella Galleries. She started out by selling turquoise and white stone jewelry and has plans to add more designs including freshwater pearls and sterling silver. Since the age of about 8, I wanted to be a fashion designer. My dream was to open my own fashion boutique. Eventually I resigned myself to the fact that I could never be a fashion designer because I wasn’t good enough at drawing. By the age of 12, my career goals had shifted toward politics and international affairs, while my dream of becoming a fashion designer slid into childhood memories. After working on several political campaigns as well as in a Congressional office in Washington, DC, I decided to go back to school and get my masters degree in international affairs and China studies. To prepare, I first moved to China to study Mandarin Chinese. Though my educational and career pursuits focused on politics, I never lost my love of fashion. Who knew that one day I would be able to combine my love of international affairs and fashion by designing and importing jewelry from China?! While shopping with a friend in Beijing in 2007, I discovered a small jewelry booth filled floor to ceiling with moderately priced beautiful turquoise beads and immediately knew that those beads would sell well in the US. The friend I was with, Silvia Stoyanova, also had entrepreneurship on her mind as she had recently started her own web design and multimedia company, Amika Studio. Excited about the idea of taking advantage of business opportunities in China, Silvia encouraged me to start a jewelry business in the US selling these beads. Having started her own business recently, she assured me that entrepreneurship was fun and not as difficult as one would expect. That week, we decided to join forces, I as the import specialist and she as the web designer for our future business. Silvia’s positive attitude and can-do determination truly inspired me to take the plunge and become an entrepreneur. Though she later decided to drop out as a partner in order to focus her energies on her own new business, she and her team at Amika Studio remain driving forces behind Abella Galleries. As time passed, the idea of my jewelry business morphed from a website for selling jewelry online into a collaborative online forum for other jewelry designers and artists to exhibit and sell their creative works. After working for over a year and a half and expending much energy and money to develop my business, it became clear why so many artists never develop their own online sales platform for their works: It’s exhausting and expensive! I decided that my entrepreneurial experience would be so much richer if I could inspire others to become entrepreneurs and include them in the vision for my business. From that point on, my online jewelry business officially transformed into Abella Galleries, a creative online jewelry and art gallery. Currently Abella Galleries features five necklace styles. Four types of turquoise necklaces: Aegean Barrel, Blue Meadow Oval, Deep Sea Oval, and Retro Round; and one type of white stone necklace: Classic White Oval. Soon we hope to add six styles of colored freshwater pearl necklaces as well as works by other artists, in particular, a talent silversmith based out of Nashville, TN. Challenge and collaboration. The challenge of doing business in China has been thrilling! Not only have I learned first-hand how to navigate the many cultural differences between China and the US, but I have also had the opportunity to delve deep into China where most foreigners never go. I have visited manufacturing facilities and assembly factories, gone karaoke singing with factory managers, negotiated with Chinese sales agents, and much more. I have been able to see a side of China that is often only read about by Westerners in books and magazines. The experience has been harrowing at times, but well worth the learning experience. The potential for collaboration with other aspiring artists further motivates me to grow Abella Galleries. So many people give up on their artistic or entrepreneurial dreams before even taking the first step to fulfill them. Sometimes the first step is the hardest to take, and by collaborating with other aspiring artists through Abella Galleries, I hope to make taking that first step easier and less scary. There is nothing more exciting than fulfilling a long-held dream, and I hope that Abella Galleries will in the future be able to help many more artists feel that excitement. Five years from now, I plan to have a great lineup of talented jewelry designers, photographers, sculptors, and other artists featured on Abella Galleries. I especially hope to find artists abroad, from China, Mexico, Uganda, or other countries whose creative cultures could add a unique perspective to Abella Galleries. I would also like to embrace fair trade practices and donate a portion of profits to educational charities in the US and abroad. What is the bestselling item in your shop? In this time of economic downturn, the versatile and affordable Blue Meadow Oval green turquoise necklace is our most popular style. It adds color to just about any outfit, from a little black dress to jeans and a T-shirt, making it the favorite of women who want a staple piece of jewelry that doesnâ€™t empty the wallet. 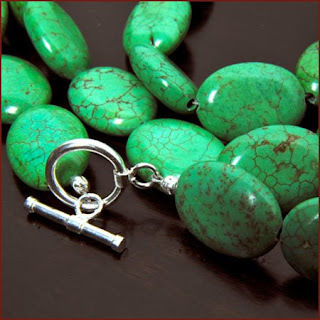 My personal favorite, however, is the Deep Sea Oval green turquoise necklace. The rich, deep green color provides a dramatic finishing touch to an outfit. Combining a Blue Meadow Oval and a Deep Sea Oval together also looks great! Abella Galleries jewelry collection is gorgeous! 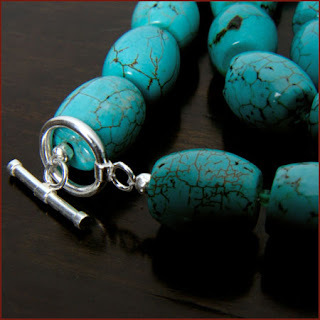 I am a big fan of turquoise and have always thought they are such a pretty stone. They offer many different turquoise necklaces and all are pretty. I received a beautiful turquoise necklace- Blue Meadow Oval Turquoise necklace. It has smaller and versatile green turquoise beads that will add colour to any outfit. I added it to my outfits which are mainly black and found it really stood out nicely. It gave me a bit of colour since I normally dress in such dark clothing. I’ve always been a fan of black clothes…maybe because they are more slimming?? It’s a gorgeous necklace and is a really good size as you can see from my picture. It’s also well constructed and the price is really awesome to at $40 for the longer length necklace that I reviewed. With Mother’s Day coming up, I think any piece of jewelry from Abella Galleries would make a wonderful gift. They also do free gift wrap and customized gift notes too! To purchase any of Abella Galleries beautiful turquoise beaded necklaces or white stone necklaces, please visit their website.